The Yankee Golden Retriever Club exists to promote the development and enjoyment of one of the world's finest sporting dogs, the Golden Retriever. Yankee welcomes members who share our love for Goldens. Yankee is a nonprofit corporation, organized in Massachusetts in 1974. 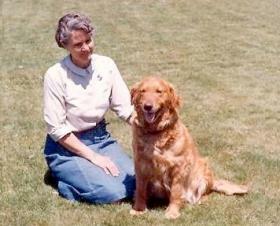 Rachel Page Elliott was a founding member of Yankee Golden Retriever Club. Our membership is composed of breeders, exhibitors, obedience and field trainers, AKC judges, and pet owners. We are people like yourself, who are interested in increasing our knowledge and in preserving the special qualities and standard of the Golden Retriever. The artwork for Yankee's logo was done by nationally known Golden artist Marcia Schlehr, and was adopted by the club in 1981. Yankee is a member club of the Golden Retriever Club of America, and is licensed by the American Kennel Club. Yankee is also a member of the Master Amateur Retriever Club (MARC), a national retriever club dedicated to the amateur handler. Yankee's first independent specialty show was held in 1994 at the Lord Wakefield Hotel in Wakefield MA, adjacent to a lake with ducks! The club hosted the GRCA national specialty in 1975, 1984, 1999, and 2008 and has hosted a number of Eastern Regional specialties. A history of Yankee GRC was compiled in 1980 by President Arlee Recktenwald. In the early 1950s an informal group of devoted Golden people came together and in May 1955 they became part of the Northeastern Regional GRC, encompassing all of the New England states as well as New York, New Jersey, Pennsylvania, and Delaware. Within a few years the boundaries of the Northeastern Regional club were narrowed to include only New England and it then became known as the New England Regional GRC. With some modifications Yankee Golden Retriever Club ultimately evolved. In late 1970 Yankee GRC was recognized as a GRCA member club, one of the first local clubs in the country to be so acknowledged. The first gatherings of the club were held at Pagey Elliott's River Road Farm and included activities in field training, bench, and obedience matches. Due to the generosity of the Elliott family, Yankee continues to hold some events at River Road Farm in Carlisle MA nearly 50 years later. In 1986 the Yankee President Sue Foster and the Yankee Board initiated a Life Membership policy. This honor is given to Yankee members who made a significant contribution to the club and the Golden Retriever breed, at the discretion of the Board of Directors and the approval of the general membership. The first Life member elected by the membership was Pagey Elliot, a great lady of the dog world with many outstanding accomplishments and a tremendous love for the breed. Mystery photos! Can you help with identification?